Sony’s latest fixed lens full-frame compact camera, the Cyber-shot DSC-RX1R II, was announced towards the end of 2015. It features a 42.4 million pixel sensor - the same as the one in the Sony A7R II compact system camera. A world’s first “variable optical low pass filter” is also included, which basically gives you the option to turn off the effects of an anti-aliasing filter depending on the subject you’re shooting. Also on board is a 35mm f/2 Zeiss lens, the same as found on the original RX1 and RX1R camera. A Bionz X processor is included, the latest Sony processor available. The main competition for the Sony Cyber-shot DSC-RX1R II is the Leica Q, which also features a full-frame sensor and a fixed lens (28mm). The Sony Cyber-shot DSC-RX1R II costs £2599 / $3299. Outwardly, it appears as if not much has changed in terms of design when comparing the Sony Cyber-shot DSC-RX1R II with the original RX1R. However, Sony has managed to add both a retracting electronic viewfinder (we’ve seen similar before on the RX100 III and IV), and the screen now tilts. Sony has managed to do this while only adding a couple of mms to the dimensions of the camera. 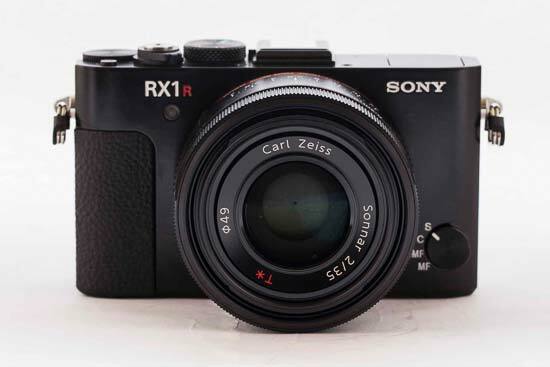 The RX1R II looks a bit like a small compact system camera, and indeed you’d be forgiving for assuming that the lens detaches - it looks like it should. If it did, then you’d basically have an A7R II though, and this is a very different proposition. In order to release the electronic viewfinder, you need to push down a lever on the far left hand side of the camera. With the RX100 IV there’s a two-step process which involves raising the viewfinder, and then pulling it out a little. Happily, here for the RX1R II, there’s just a one-step process which makes everything much quicker. Once you’re done with the viewfinder, you can push it back into the housing. There’s a sensor on the viewfinder too, which means that when you lift the Sony Cyber-shot DSC-RX1R II to your eye, the viewfinder will switch on and the rear screen will switch off. This makes for a smooth transition between using the screen and the finder, and more akin to using a traditional camera. The new viewfinder comes at the expense of the RX1R II’s built-in flash. It’s arguable that this camera is designed with those who like to shoot in natural light, but it’s worth considering that you will need to invest in an additional flash unit if you need one. In terms of using the camera to make changes settings, the Sony Cyber-shot DSC-RX1R II is pretty much the same as its predecessors. Around the lens you’ll find three rings, one for altering aperture, another for switching to macro focusing, and a third for manually focusing. There’s a switch just to the side of the lens for switching between single, continuous and manual focusing. The aperture ring has numerical markings for each aperture stop, and lines for the third stops in between. As you turn the aperture ring, it clicks which is quite satisfying, but could have an impact on sound for video. Those with larger hands may find that the aperture ring is a little awkward to use - it’s something you get used to with practice, but because it is so close to the body of the camera it’s not entirely comfortable. The lens rings can’t be used for any other function than their designed one. So, for instance, if you were shooting in shutter priority, the aperture ring has no use. It would be nice if you could customise the rings to control other functions if you wanted to, especially when you consider that elsewhere on the camera, there’s a high degree of customisation available. 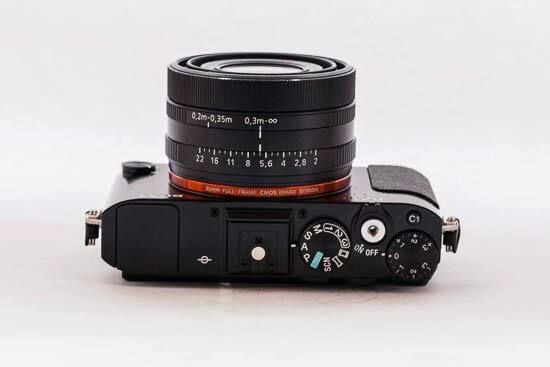 On top of the Sony Cyber-shot DSC-RX1R II is a custom button, with another found on the rear of the camera. These can be set to a number of different functions, such as ISO or white balance, but you can also change the functions of the four directional keys, the central button, the AEL button and the scrolling dial around the central button. Also on the back of the camera is a small scrolling dial which is used for altering shutter speed when using the camera in manual or shutter priority. A mode dial for choosing between the various exposure modes, including manual, aperture priority, scene and automatic, is found on the top of the camera, along with a dial for setting exposure compensation. This second dial can be reached very easily with your thumb when holding the camera in one hand, allowing for quick changes to be made. There’s no touch sensitivity available on the RX1R II, Sony continues to be reluctant to want to include such functionality on its most expensive cameras. If you want to set the AF point, instead you’ll need to press the central button and then scroll to the point you need. As the AF system comprises of 399 points, it can take a while to get to the exact point you need - which is a shame when you’re trying to capture something which may move (such as street photography, which is a subject this camera should be perfect for). You may find it’s quicker to use a “Focus and recompose” technique and stick to just using one focus point. A function menu can be accessed by pressing the Fn button. Here you’ll find a selection of most commonly accessed settings. You can completely customise this function menu to only have the settings you want, and get rid of the ones which you don’t think you will use. To record video, there’s a small button just to the right of the thumb rest. It’s unlikely you’ll accidentally knock this on, but it is a little awkwardly placed. Unlike some of Sony’s other current cameras, the max resolution available on the Sony Cyber-shot DSC-RX1R II is full HD (1080p). It seems reasonably likely that 4K isn’t possible because the small size of the camera may make it prone to overheating. Along with the other new features of the RX1R II, Sony promised a 30% improvement in autofocusing speeds. That seems to be borne out with the camera able to quickly lock on to the target in good light, with speeds dropping a little in low light. It’s not usual for the camera to provide a false confirmation of focus, and even in very dark conditions, the camera usually eventually gets there. However, processing speeds are a little on the slow side. This probably comes as a consequence of the huge file sizes that a 42 MP sensor produces (raw files are around 80MB). 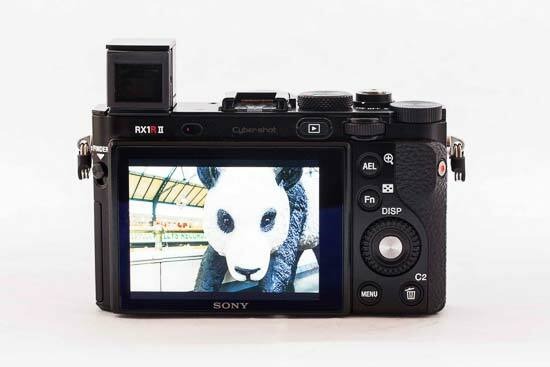 It can take a little while for the Sony Cyber-shot DSC-RX1R II to be ready for you to change any settings in the immediate few seconds after you take a shot, and it’s also pretty slow when you want to playback images, or zoom in to check critical focus. 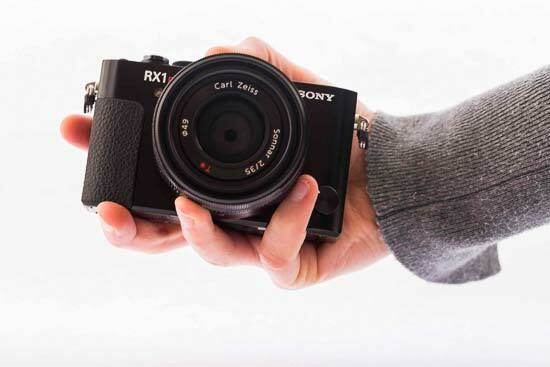 Battery life is quoted as 200 shots for the RX1R II. That’s a pretty modest amount, but when a camera is this small but needs so much power, it’s not particularly surprising. During testing, battery life started to drop to show one or two bars after around 100-130 shots. It’s definitely worth investing in a second battery if you need to shoot all day.